President Moon Jae-in and the floor leaders of all major political parties held a luncheon on Thursday at the presidential office Cheong Wa Dae and agreed to launch a negotiation group involving government and ruling and opposition parties, to deal with various legislation related to the people's livelihood and regulation reform in the extraordinary parliamentary session in August, and to work together to hold a successful inter-Korean summit in Pyongyang. The luncheon was attended by Hong Young-pyo of the ruling Democratic Party, Kim Sung-tae of the main opposition Liberty Korea Party, Kim Kwan-young of the Bareunmirae Party, Chang Byoung-wan of the Party for Democracy and Peace, and Yun So-ha, acting floor leader of the progressive Justice Party. 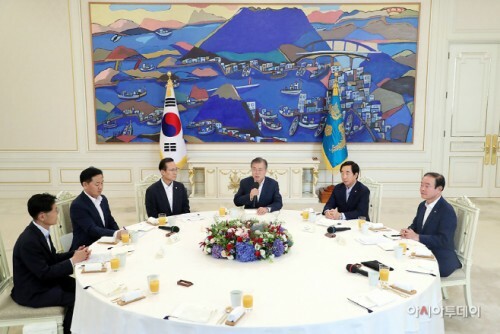 President Moon and the floor leaders of the five political parties agreed to form a joint policy consultation group involving government and ruling and opposition parties for facilitating government-parliament negotiations. The consultation group will meet once every quarter, with the first meeting to be held in November, after the government addresses the National Assembly on next year's budget. President Moon has continuously stressed the need of forming a joint consultation body with political parties to discuss government policy since taking office in May 2017. However, the discussion has not progressed further. During the luncheon, Moon proposed forming a joint consultation body again and the floor leaders of the political parties were all positive about his proposal in hope of improving communications between parliament and the government. The parties and the government also agreed to cooperate in processing bills related to people's livelihood within the August parliamentary session. The bills include those concerning regulatory reform, supporting small merchants and low-income families. In particular, President Moon and the floor leaders agreed to cooperate to substantively advance the denuclearization of the Korean Peninsula, establish permanent peace, and promote inter-Korean exchange and cooperation. To this end, the parties said they agreed to support the government to hold a successful inter-Korean summit in Pyongyang scheduled to take place in September. "It will be a great support in the summit talks in Pyongyang if the National Assembly ratifies the Panmunjom Declaration," Moon said. He also offered to include parliamentary representatives on his scheduled visit to Pyongyang for inter-Korean parliamentary talks. "I believe it would be a great help in pushing for a South-North Korea parliamentary talks if the parliament ratifies the Panmunjom Declaration before the Pyongyang summit," the president stressed. However, there was no consensus on the part of the National Assembly's ratification of the Panmunjom Declaration.